Now that you have finished creating your list of topics. You have come to the point in which you would like to make some changes. We have now given you the chance to add additional topics to your list. To edit your list, you have two possible ways to get started. Click the Edit List link from the red navigation bar at the top of the ThinkTank home page. 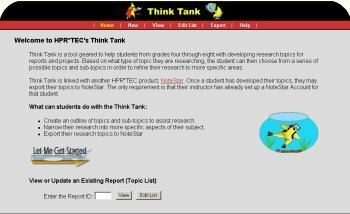 From the ThinkTank home page, enter your Report ID in the field under View or Update an Existing Report. Then click the Edit List button beside it. This page acts as a security checkpoint to ensure that only the person who created a topic list can edit. In the Report ID Number field, type the report ID number given to you whenever you created your list. Now, enter your password into the next text field. When finished, click the Continue... button. This page is the first of a series of pages that guide you through editing your topic list. From this page you may choose to modify subtopics, add additional topics, and delete topics. If you would like to change your subtopics, click Modify Subtopics. On the Update Subtopics page you may delete any given subtopic or add new subtopics. To delete a subtopic, select the subtopic and click the Delete Subtopic Button. To add a new subtopic use the Random Topic Generator, which produces the first half of a new subtopic. If you like the subtopic starter, fill in the rest of the sentence. Then click the Add New Subtopic button. If you do not like the current start, click the New Random Topic button.When you are finished updating your subtopics, click Done. If you wish to add new topics, click the Add Additional Topics button to begin. Below, you can see the steps involved to adding your new topic. We have not included further details because this is almost identical to the process of creating your first topic. Once you finish adding new topics and subtopics, click View Your Topics button. If you would like to delete a topic click Go to Delete Topic. Select the Topic you want to delete, and click Delete This Topic. To select an item, click the circle beside the item you wish to delete. Once an item is selected, a black dot will appear inside the circle. Click Done when you are finished. Then click View Topics. Now, you may print the final outline for your project.